Looking for some replacement strut suggestions. My current MS struts are shot at 75k of use. Car is my dd. I have the MS springs, front and rear sway bars, and front strut bar. Should I get MS struts again or another brand like Koni? Does anyone know of a Coil-Over that will keep me OEM heigth at the high end? So +/- .0 - whatever for adjustment. I need to stay stock heigth to gt in my driveway but would like to lower for the track, meets, etc. how long did it take for your tein s techs to settle anyone? did you have to realign? They won't settle much if you didn't already unload them since installation. so i need to uncompress an then recompress them? Truva, what I am referring to here is what some people call "preload" of springs. I call it unload. If you didn't unload the springs on the front during install, that could be why it is still sitting high. If you did "preload" then you can still do one other try. You can unload any binding in your driveway without removing your tires. PM me if you need details, and yes you should get a performance alignment since your ride height is different now. Springs / suspension / tire info. Inexperienced here and need help. Front drop: 1.2" --- Rear drop: .8 "
Front drop: 1.42" --- Rear drop: 0.71"
Front drop: 1.1" --- Rear drop: 1.1"
I just replaced my shocks on my 05' rx8 with 18" inch rims. I put on Bilstein all around and now my front end is sitting 1 - 1.5 inches higher than before. Now I know this seems impossible but it does in fact sit higher. I have had 3 diff places check the spring seats and they are the correct way. I don't like the way it looks now but I have spent a good deal of money (on my budget) to get these shocks. Not sure what I can do about the front end sitting at 15.6 inches from center of wheel to fender,, rears are 14.5 from center of wheel to fender. Also am running 245/40 18 tires and wanted to know if I could move up to 245/45 18 tires. Tire rack says that our rims are too narrow for that tire but discount tire direct.com says 245/45 are an optional size. Any help anyone could give would be appreciated. That's a no-go on the tires, they probably won't fit. I know your trying to over-compensate for the wheel gap, but you're already dealing with a tire that is close to stock height. You don't want to go over 26" in height. As far as your Bilstein issue, they're high pressure units just like the factory installed sport Tokico's. I would suggest a set of lowering springs to level things out. If your car is already sitting so high, it will not drop too terribly low. You'll be fine, and your 245/40's will thank you for it. thanks, it did help. I just don't want to drop the rear end of the car anymore than it is. I think I'll just deal with what I have until I have the money to do everything over again with diff shocks and springs. Let me ask one more question if I can.... If i put a set of LOW PRESSURE shocks on the front will that help at all or will that just effect the firmness of the ride. I have read on other sites that it would help the car be less "lifted". Last edited by waterproofone; 06-27-2012 at 07:28 PM. I have a question about suspension height that doesn't seem to be addressed. How does one determine the height and why? Now I can understand wanting it low and slammed for looks, but how and what determines height for track aplications. My car is my dd and I track atleast four times a year. I am on stock suspension right now and one of my shocks is starting to get wet so I will be needing to upgrade soon. Last edited by TANKERG; 09-26-2012 at 02:38 PM. According to the service manual, height is measured from the center of the wheel hub to the inside lip of the fender. 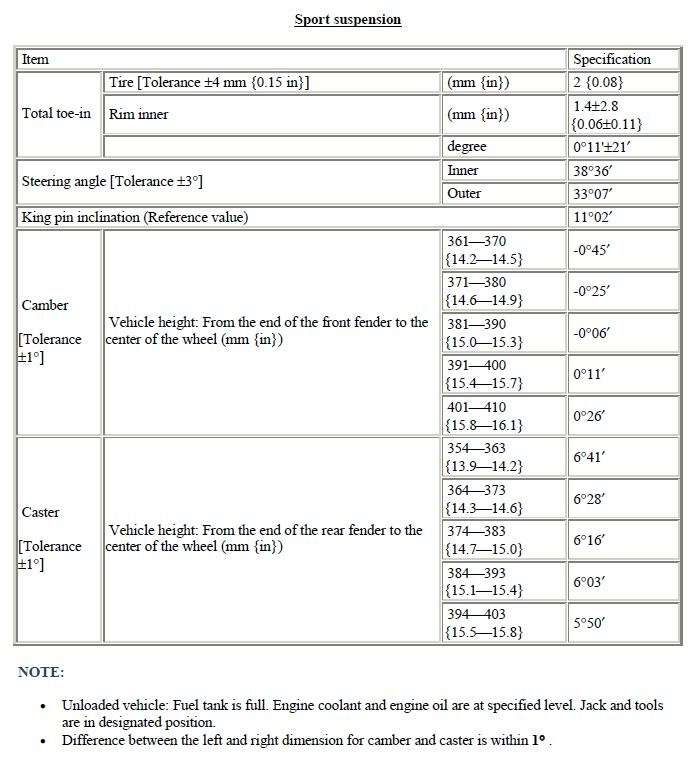 The service manual specifies different ranges for "in spec" alignments based on ride height. Measuring height this way will take tire diameter out of the equation. Last edited by JCrane82; 09-26-2012 at 02:51 PM. Thanks for the quick response, but when and if you lower the car for a track day aplication how do you determine the ride height? What are the advantages of lowering it from the stock height and how do you determine how low? Thanks for the quick response, but when and if you lower the car for a track day aplication how do you determine the ride height? Since you are talking about lowering the car for track days, I am assuming you are on height adjustable coilovers. If this is the case, then the height you want to lower to is really your choice. Just remember than changing the ride height will require a realignment. What are the advantages of lowering it from the stock height and how do you determine how low? Lowering the car will lower the center of gravity (CoG), which in turn will lower the roll center of the car, increasing roll stiffness. The negative effect is that the suspension (assuming you have realigned like you should) will no longer be in the nominal working range that it was originally designed for. This is OK though, if the spring stiffness has also increased to limit travel. There is a limit though, where you can lower the car too much and actually make the car handle worse. Your suspension needs travel in order to absorb bumps. Lower is not always better, just like stiffer is not always better. This comment is strickly in regards to performance handling, not bling bling hellaflush fitments. Generally the stiffer the springs, the lower you can go without causing issues. This is an extremely general statement though, and suspension tuning has no absolute right answers. Usually the answer to suspension questions is "it depends". This answers a lot! Thank you. Late response, but I just got a hold of a set of Mazdaspeed springs and measured the fronts compared to the Racing Beat springs. The diameter of the wire is exactly the same, but the RB has 9 turns compared to the 8 of the MS. Since the drop is also about the same, and assuming they're made of the same material, the MS spring rate is higher than the RB. I does seem unlikely however, that the MS rates are as high as given in post #1. As you stated, this is not inline with posted spring rates. 1. 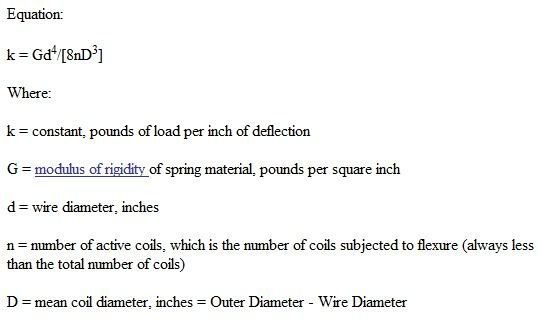 The springs might not have a constant pitch on the coils (progressive springs) which would make these simple hand calculations inaccurate. I agree that the difference in height would be negligable, and wouldn't be causing this difference in calculations. so Stock 'Sport' Suspension RX-8: 156/113 (F/R) is the same for a 04 base model rx8. just want to make sure. looking to get some springs and trying to stay close to the stock rate as possible. The sport suspension came on all 18" wheel models (some autos and all manuals). The 16" base automatics had a softer spring rate. Most springs are about 30% stiffer than stock. Search for the "calling all lowering springs" thread. Thanks for pointing out the "calling all lowering springs" thread. Everyone here asking questions really needs to look over that page. One thing i found to keep in mind is many springs do not meet there claimed spring rate. There was a point I almost bought a very expensive to to check on actual spring rates. Handy thread, looking at new coilovers for my RX8. I just bought the BILSTEIN PSS9 COILOVER SUSPENSION KIT for my 05 Shinka. Any recommendations for the mounts? Should I use the ones already on the car or buy new ones, if so, which ones? Thanks in advance.